For many years I was all about early retirement. I remember telling anyone who would listen that I’d be retired by 30 back when I purchased my first investment property at the age of 24. I was cocky in a way that only a 24-year-old with a high corporate salary can be. No kids, just money to burn. Or buy houses with. The thing is, I turned 24 in 2006. And we all know what happened to most real estate markets in the years following 2006. Bright young things were blown off their perches, their dreams of early retirement transformed into visions of endless cubicle life. It wasn’t until I discovered personal finance blogs that I realised early retirement was possible without a multi-million dollar property portfolio. I was (and continue to be) inspired by bloggers pursuing early retirement via frugal living and high savings rates (some as high as 65%.) Some had already left their jobs. Some are very close. Most had a date in which they could hand in their notice and become official early retirees. Every single one of them inspired me to be better. To try harder. After I had my babies, I realised that I didn’t actually want early retirement. Well, technically that’s a lie. If I won the lottery I probably wouldn’t continue to work for money. But for me to get to early retirement stage would mean putting my boys in full-time daycare and going back to the corporate world in order to save 25x our annual expenses. And not travelling for ten years. No, thank you. I’ve spent this past year trying to figure out exactly what I do want, or more precisely, what will work for my family and I think I’ve come up with a workable alternative. (Update: May 2018 – read how I’ve almost achieved my income goal). For some of us, early retirement just isn’t possible. For whatever reason – digging ourselves out of the suckhole of consumer debt, having babies or returning to studies later in life mean we haven’t emerged from our twenties with huge pots of cash. That’s not to say we’ve failed, after all, you wouldn’t be reading this blog if you didn’t have an interest in money. You might be like me, with a few investment properties under your belt and a rock-solid idea of how to get where you’re going. You’re just not there, yet. I want you to know there is an alternative. A not-often discussed alternative. Semi-retirement. Defined by the Oxford English Dictionary as “having retired or withdrawn from employment or an occupation but continuing to work part-time or occasionally”. Early Semi-Retirement: It’s when you only need to work part-time, as you are able to cover your expenses on a drastically reduced income. It’s usually because you made awesome choices to save half or more of your DINK income when you were younger because you knew you’d never pull that kind of coin when you had babies. Not because they are expensive. They aren’t. But not being able to work your high paying corporate gig is one hell of an opportunity cost. Then you chose to invest (you legend!) but your investments aren’t yet at the stage where they could support you. That’s cool though, because now you are in an oddly comfortable spot of needing just a little cash in order to live your dream life. Since deciding that early retirement was not the right choice for us we’ve veered towards semi-retirement with a vengeance. We still don’t want (or need) to work full-time to have the life of our dreams, but we can’t quite afford to chuck it all in. (I’ll share my numbers later in the post). We’ve worked really hard to get to this point – by following all of the points below. I cannot stress this enough. Any debt that makes you poorer must go. High-interest bearing debt is anathema to lifestyle options. Car payments, credit cards, hire-purchase and (shudder) payday loans are emergencies. You must prioritise them over everything else. Save a little cash in case of emergency and then knuckle down to clear those horrible debts. For me, becoming free of bad debt was the catalyst to a richer life. I’m not saying you should buy a house, but if that’s right for you, go for it. What’s important is that the place you choose to live in is affordable. When we were living in a big city and earning big incomes we lived in a rented apartment, shared with another couple. The rent was approximately 10% of our combined income. Keeping your housing cost low frees up a lot of cash for building wealth while you are young, so you can semi-retire (early) in your thirties. If you are buying, pay no heed to what the bank will loan you, they have zero interest in you paying back your mortgage early and saving hundreds of thousands in interest. Check out what the median price is in your area and aim to buy well below that. Then get in roommates to help you nail that mortgage. If you are renting, make sure you invest the extra cash you save by not being a home-owner. Work out your core expenses and budget around those – not the other way round. Allow yourself only that fixed amount each month and save or invest the rest. Our monthly budgeted expenses closely correlate with a minimum wage income – so basically we pretend we are poor. It does wonders for keeping expenses low. You should spend time learning how to be frugal (it doesn’t come naturally to a lot of people – me included) and pursuing interests that are either cost-neutral or net you some food (gardening, foraging) or even better, cash! 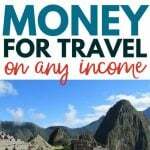 The secret to being able to choose whether you want to take some time off to travel, or take a part-time job whilst working on a passion project is to have multiple income streams. You could be earning a small amount from a rental property, interest on a term deposit, dividend income, have a regular weekend gig, create an online side hustle or even start a small business. When combined all your small streams of income help to replace the funds lost from your full-time job. Because you’ve chosen to bow out of the rat race you need to be prepared for the questions, judgements and opinions of others. This is not normal. People will assume you are on the dole (social assistance) or bludging off somebody else. Especially if, like us, you choose to live in a lower-socioeconomic area with cheap real estate. And you drive a banger from 1992 with broken electric windows. Here’s a rundown if you’re new here. I’m from New Zealand (where we live) and my husband is from Ireland AKA the exact opposite side of the planet. We have 2 boys and we want them to foster close relationships and build great memories with both sides of the family. Flying to Europe from New Zealand costs a lot of money. For our family of four it will range between $6000 and $8000 or to put that into perspective, the equivalent of 12-16 weeks of full-time work at the minimum wage – and that’s just for flights. For that reason, we don’t like to go for short periods of time. We prefer three months at a minimum. I came up with the idea of chasing the summer around the world, meaning we’d live and work in New Zealand for nine months of the year and hustle hard to get enough money together to spend the northern hemisphere summer in Europe. We’ve done everything we can to reduce expenses, by downsizing our house and living on a tight, fixed budget. The reason I define our lifestyle change as semi-retirement is because my husband will still have to work a regular job (albeit a seasonal or contract role) for eight months of the year. I still have to bring in new business and continue to work while we travel. But for four glorious months of every year my husband and I will both be stay-at-home parents and able to pursue our greatest passion: travelling! To achieve this dream lifestyle we need an absolute minimum of $42,000 per year, after tax, cleared income. Months 1-9 we will be based in New Zealand, and therefore our expenses will remain static at approximately $2200 per month. We’ll be trying to get that down as low as possible but I’d rather assume higher so I’m going with $2500. Months 10-12 we will be either out of the country or if the budget is tight we’ll be travelling around New Zealand (not the most terrible alternative :-)). Although we won’t be staying in the house we will need to maintain the mortgage and utilities. Eventually, we would like to rent our house out on Airbnb (referral link) when we travel, which will help offset a portion of our travel costs. Our monthly expenses in months 10-12 are $6500 consisting of travel ($5000) and essential costs of maintaining our home ($1500). I’m counting on a worst-case scenario here. That’s a minimum wage job for my husband (which is very unlikely as his skills are pretty much always in demand but planning for the worst makes me feel better). If he takes a seasonal or temporary job and earns the minimum wage for 8 months that is $20453 before tax or $16616 after taxes. I have to make up the difference of $25,384 in my business. That is a pre-tax income of approximately $33,500 per year (remember I can run my business from anywhere so I will be working during our travel months). I am confident that I can earn at least that much and still have a great life with loads of free time. Eventually, we will be able to rent our main house while we are travelling which would help offset the high expenses we would have for the three months of the year we travel. We spent our twenties investing in real estate. We made some pretty horrid mistakes but we also did some things right. Currently, our rental property portfolio is self-sustaining. Meaning the combined rents cover the combined expenses. Right now, there is nothing left over for us to draw as income but eventually, there will be. As for shares, we are in the accumulation phase so again, there are no income streams right now. How will this plan affect our traditional retirement plans? This lifestyle only works if we can pay for current expenses and save for the future. If we can’t do both of those things we’ll have to cut our travel fund. Period. Our properties are slowly being paid down, and I expect values on all but one of them to rise. We will still contribute to traditional retirement funds and we include a monthly contribution to index funds in our budget. We don’t have to worry too much about the future as it’s taking care of itself. Lesson: Lay a solid foundation when you’re young, and time + inflation + compound interest will do most of the hard work for you. For us, semi-retirement makes sense. We could chase big salaries and shoot for a decade of extreme saving to hit early retirement, but we’ve decided that while our boys are young, we can take a little sacrifice. When the youngest is school age, we’ll likely re-evaluate. But for now, a combination of work and extended leave allows us to pursue our travel goals whilst still retaining some semblance of a solid home environment for our boys. Having the luxury to choose this lifestyle is proof that the road to financial independence needn’t be absolute. Just figure out what works for you and go with that. I love the tiny house idea! I am impressed with your budget/plan here, the numbers seem completely achievable. Bring it on! Anne, your mention of the tiny house reminded me of a documentary by the name “Tiny”, I had watched a while back. It really makes you rethink what we really need to be content. Here is a link: http://tiny-themovie.com , may of interest to you if you havent watched it yet. Emma, congrats on the progress towards the goals thus far, enjoyed the post. Thanks – I adored that documentary. 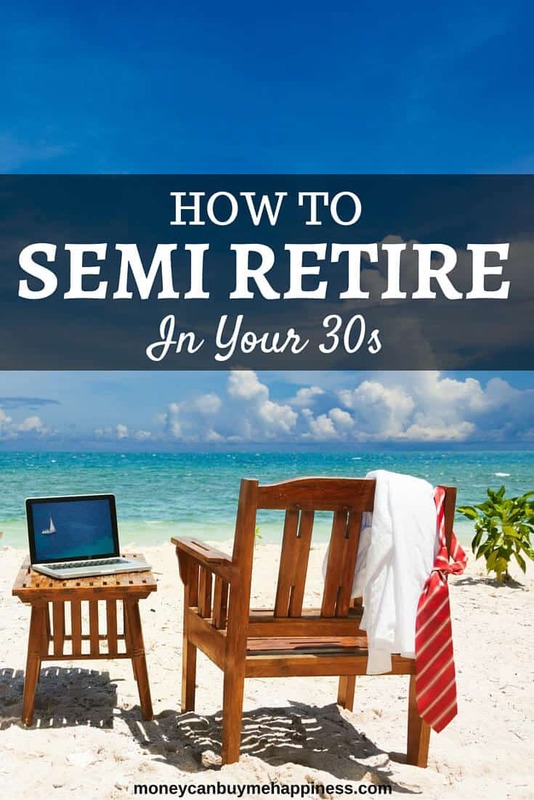 Great tips on prepping for early semi-retirement. In hindsight I think I would have enjoyed life just as much if I had quit working full time a little sooner and developed some hustles to bring in enough cash to supplement our investment returns. We ended up going all the way to “regular” early retirement and it worked out fine. As a fellow Kiwi, living in the same city actually…..! Just wondering what index funds you are using? Smartshares? I am interested in getting into index funds, although we have just got our first investment property so will need to balance things out. I like the idea of doing a bit of both of real estate and index funds. Kiwisaver is fine, but doesn’t seem to compare to all the other tax advantaged accounts you ready on other blogs! Nice to have a NZ perspective, thanks. Hi Jasmine. Nice to hear from a fellow Cantabrian! We have gone with SmartShares but Superlife also offer ETF’s. We’ve gone with the Total World Fund which is directly invested into Vanguard Total World Stock ETF. Inspiring and helpful, thank you! That’s a great goal Michelle. You’ll totally nail it at the rate you’re going. My favorite line: “Having the luxury to choose this lifestyle is proof that the road to financial independence needn’t be absolute. Just figure out what works for you and go with that.” Hear, hear! We’re still in the DINK stage (and plan to stay there, until we become ZINKs — zero income, no kids) 😉 so can sock away savings quickly, but I’m positive that if we did have kids, we would be doing pretty much exactly what you’re doing. We’d want the kids to see more of the world than their own backyard, and for us to be able to have more time with them than the crazy-paced jobs we have now allow. Good luck! Thanks for stopping by ONL. Love the ZINK term 🙂 Kids are awesome but they really do put a spanner in the FI works. I’m so glad we made the most of our DINK money while we could. Emma, i just stumbled upon your blog and am delighted to hear so many of my own sentiments echoed in your post. Your desire to forge strong family ties is commendable. Your plan is inspiring, and I look forward to following along with you! Sounds like an excellent plan! It’s fantastic that you’ve found a way to partially live on both sides of the globe so that your children can know both sides of the family (and different countries!). Thanks Dee – we shall see if we can actually pull it off! Love this post…and the one about why early retirement is not for you. At points I have really wanted to retire early like the bloggers you mentioned but it’s tough. We live in a high cost of living area (NYC) and have a son (and another boy on the way). If we choose to stay in this area (our families are both here), retiring early would be difficult. Affordable housing is not available here! So semi-retirement is a great choice. We just have to figure out a way to find side hustles or part-time work that we enjoy. Nice post and gives motivation. I think the best is also doing something you love. I wanna work, but on my own terms and I don´t have to give it up at age 65. And don´t be to strict with saving, you also just live once and can be over fast. Thanks Philipp, it’s all about finding the right balance. I completely understand the desire to make semi-retirement work rather than waiting to go the full retirement route. I would so much rather enjoy life sooner and work a little rather than working a lot for eventual enjoyment. I think we are also going this route as well but don’t have things quite figured out yet. I hope you can make your plans a reality! Thanks Mrs. SFF. Making the plan is half the fun! Great synopsis – I’ve termed our goal “semi-retirement” as well. We have a lot of debt to pay off. Our hope is to get to a point where we will need only enough income to support a frugal lifestyle – with 401K savings to help support us in later years. Best of luck! Gotta love those semi-retirements! Although slightly different, my wife and I will be spending the summer in Costa Rica (we’re from the US) where we’ll both be working online a bit while enjoying the tropics. It’s only for three months before my wife begins her next degree, but it’s great to have an opportunity to have a “mini-retirement”. Very inspiring article. Thanks for sharing. Thanks Rob. We’d love to visit CR one day. Sounds like you have found a great mix of work and play. Yay, a Cantab financial blogger – even if your’e overseas (BTDT!). When are you thinking of being in NZ though? We’re in autumn about to hit winter, so I’m confused! If this is the first time you’re attempting the 9-month thing, you’ll be okay for work obviously, but do try and get a work visa with no restrictions for hubby – although if you base yourselves in Canterbury there are easier restrictions due to the rebuild. (I work in HR and deal with applicants with visas regularly). Good luck – I’m looking forward to following your blog. I’m hoping to go part time soon, myself, and my dream has always been to find the dream job that lets you summer all year round. I am a kiwi but am lucky enough to hold an irish passport – so the reverse of you, with a few years added! Hi Susan, thanks for your comment. I love hearing from a local 🙂 I’m in Chch now. I’m an NZ citizen and my husband is a dual citizen of Ireland and Australia so he can work here freely. My kids will have both Irish and Kiwi passports – what a fab combination – all of Europe and Australia/NZ to choose from. A dream! Our plan is to be here in NZ from September to March/April – escaping for May – August ideally but if we can only do three months we’ll take June, July and August. I don’t mind May so much. However this year due to the new baby – and needing to get the house ready for airbnb-ing we will be taking off a little later in the year. I think we are quite lucky here with seasonal work and if push comes to shove I’ll happily go temping. It’s always been my go-to when I’m between jobs or just after travelling and need some extra cash. Look forward to having you along! I’m off to check out your blog now. Have that same dream too, and I’m somewhat doing it now thanks to the stuff I invested in during my first six years working. It’s not much at all, but slashing expenses to the bare minimum (with a little allowance for fun activities) does the trick. Anyway, now I’m trying blogging as well to earn income doing what I love (beats the 9am-5pm rat race any day). Loved reading your blog, im at the other end of my working career. My husband and i have lived a frugal life with our 4 children (now young adults) We are not materialistic, much to the judgement of ‘others’, but this has allowed a return visit to NZ every year from Australia, (not a long or expensive flight until paying for 6 persons), and allowed us to travel with the children for 13months around Australia whilst renting our house and living off savings. We are looking forward to retirement, we have set a date. People waffle about not having enough money to retire, but it again depends on whether you value a wardrobe full of designer clothes and cupboards full of gadgets over finanical security. Life does throw lemons occasionally, but having finances sorted will make the lemonade stall boom. A great read, you are right on track. Great post! I’m already in my 30s, but I definitely want to create a lifestyle now that I don’t have to work for the rest of my life. I actually get bored doing nothing. . Told myself I’d NEVER but it’s true. While doing ‘nothing’ might sound pretty sweet to some, it’s just not what we were put here to do. We’re here to serve in some form or another, I believe many. I agree with you about enjoying some of your money. We live in a 1940s bungalow with original kitchen and bathroom, so right now we’re dropping thousands on renovations. BUT.. we plan to stay here for the long-haul, at least until we can move overseas, and then we’ll rent it out so we’re sure it’s money well-spent. You rock Em’ Such a great way of thinking and in turn – living! Thank you, Tammy! Most of my business income at the time of publishing this post was from providing marketing support and website help to clients, although now I make more from freelance writing and have started to shift away from digital marketing support. This is my goal too! I’m not there yet but I know kids will be in my future and I will want to take some time off to give them the best start I can. Planning a few years ahead hopefully I’ll have the ash reserves and passive income to allow me to work part time without feeling any financial pressure. I love the way you so practically break down your income and expenses to make your plan a reality.